By the way, reading this discussion made me smile this morning when I got into work. If it is, indeed, coming in half hour increments, I'd expect no more than 24 hours of it. That's a lot of sketches. Is it just me or is that speeding up quite a bit? murrow wrote: Is it just me or is that speeding up quite a bit? I definitely think it is. It seems to be coming every 5-10 minutes. I've been refreshing every few minutes, and it has been changing. Am I the only one that feels the same sense of discovery that came with "Click And Drag"? When I refreshed and found her laying down, I was taken aback. It's all so simple, but it's so strange. The punchline is going to be "I just wasted (large number) man-hours of it." No, I'm still only seeing it change every half hour. Some other people are seeing it switch back and forth between recent and older panels, sometimes, though... which I think is the result of weird caching behaviour, not it actually changing. Be warned though: it's not just minified, it was clearly pretty obfuscated before it was minified. Huh, that's new. Definitely wasn't there when the strip first went up. However, pulling it apart, it looks like it doesn't actually contain any information that'll help us find future panels - that's still all serverside. I think this is just some fanciness to make it automatically change if you just leave the page open, so you don't have to keep refreshing. Last edited by phlip on Mon Mar 25, 2013 9:04 am UTC, edited 1 time in total. Honestly I'm loving this. Though I do think it is simply changing on the half hour. So far I have 9 images. I might be missing the first one from being late on the uptake. If anyone has the permalink to it (or if could tell me for certain that I've caught them all), I would appreciate it. The script is using HTML5 Server-Sent events to update the image programmatically. So the timing could change at any time. She's back up... Wasn't expecting to stay up all night watching XKCD slowly change. I wonder what they're talking about. At the end of the JS it says /comics/time/something, could anyone take a look at it? I refreshed the page after clearing the cache. It's gone back to image 1. Has that happened to someone else? Just ignore the random stuff at the beginning, start at the end: It waits for an event (which probably comes from Randall), then JSONs a new hash and changes the shown image. Ok, well they are now definitely moving of their own accord. The page must be auto refreshing somehow because they have moved a few times for me in the last half hour or so without me refreshing the page myself. Or is it starting to drive me insane to the extent that I am seeing things?! shashwat986 wrote: I refreshed the page after clearing the cache. It's gone back to image 1. Has that happened to someone else? Me too. I wonder if it's done? It feels a little too simple for it to be done now. I haven't pulled it all apart, but I recognise a couple of the pieces... it's a way for the JS to connect to the server and wait for the server to tell it when there's a new panel up, so it can automatically load it up. So you can just leave the comic page open and it'll automatically load the new panel, rather than having to refresh it constantly. The bit that tells you what the next panel is is still serverside, so that doesn't help us find the new panels faster... it just hopefully reduces the server load somewhat. Guys first post here. I couldn't just lurk this out. The meta-narrative in this piece is so great. And by piece I'm including all of you fans. I mean, all of us. 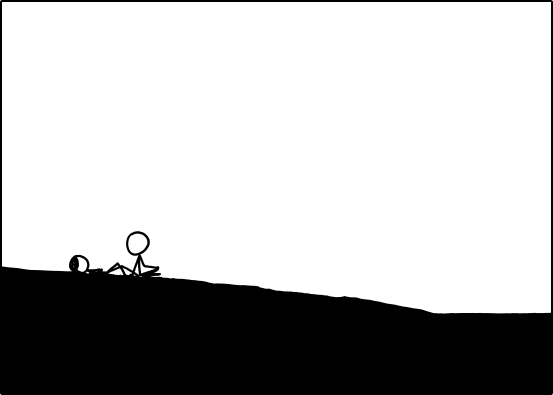 There are so many levels that are only possible by XKCD having a so particular fandom. I could layer level of fascination uppon level on fascination but I will only say that Munroe said "time, you have to wait for it" and all of us are instantly trying to beat time. Going back to lurking mode. It's only a matter of time for everything to unfold. phlip wrote: I haven't pulled it all apart, but I recognise a couple of the pieces... it's a way for the JS to connect to the server and wait for the server to tell it when there's a new panel up, so it can automatically load it up. So you can just leave the comic page open and it'll automatically load the new panel, rather than having to refresh it constantly. The bit that tells you what the next panel is is still serverside, so that doesn't help us find the new panels faster... it just hopefully reduces the server load somewhat. Perhaps the hash is somehow based on the id? Anyway, I think we can just give it up right now -- I suspect Randall didn't want us to break this, and the easiest way to do that would be to simply not let the hash be systematic. Yeah, I think having the usual traffic multiplied by our eagerness may have melted his server a bit. JS a late addition to prevent unnecessary loads? Looks to me like Randall is setting something up for this year's April 1. That's apparently Randall's BitCoin address. This has prompted me to listen to Pink Floyd's The Dark Side of the Moon again. Thanks Randal! The file names still get determined on the server, as well as the interval at which new images get displayed. We did not invent the algorithm. The algorithm consistently finds Jesus. The algorithm killed Jeeves. The algorithm is banned in China. The algorithm is from Jersey. The algorithm constantly finds Jesus. This is not the algorithm. This is close. It is waiting for the comic/time function to show a new image, that bit is clear... But I don't understand that use of the random element function... Anyone can clear that up? I mean, they're just waiting for us to crack the code! It's just a random delay between there being a new image, and it loading the new image... so that it doesn't result in everyone trying to load it at the same time. Her hair is thinner, I guess. Are they growing old? I was hoping to learn some c tonight, not bang my head against hashcat for 3 hours.